It's already 11.40 a.m. I was checking today's date coz I need to run a program in the system when I realized it. Shiiittt!!! It's Cembam's birthday!! Hurriedly I texted her, yep..texted not called..it's just our thing y'know. I wished her in the text message with some lovey dovey kind of wish and sent. I also said sorry coz I wished her a bit late. She replied "it's Ok and ...................". Hehehe..See..it's our thing. The phone at my desk is not yet functioning. I would call her right away if it's working. My prepaid is less than RM3..huhu. So, Cembam understand that. Actually I kinda forgot that today is 16 because my present has already reached her hands yesterday. I posted it via DHL on Monday and it reached her the next day eventhough the staff said it would reach her on Thursday. I printed her the album (that you can see in my flickr or the efendism blog) for her present. She likes it of course. Hehehe!! 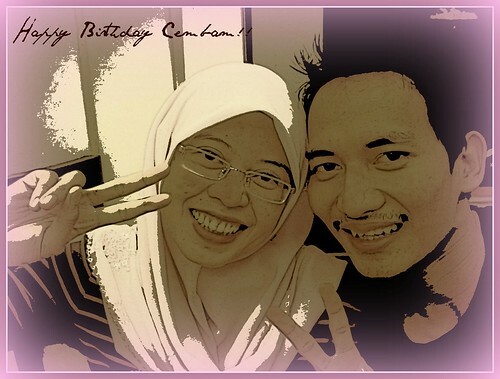 So, happy birthday Cembam..another year of your life. Hopefully it would make you a bettr person, can cope with any situation calmly, blessed by Allah with his merciness and forgiveness. muka cembam ade iras² muka jard aa.hehe..
pepepun hepi besday tuk cembam and slmt hr ry mf zhr btn tuk korang berdua. hepi bday to cembam ko. uhukk thanks to all wishes..luv u laling..hehehe..
maksu menang raya gaya mamee!!!! happy bfday! yg keberapa ni? hehe..